•Advanced TLC technology provides operational reliability and durability resulting in fewer repairs and an extended lifespan. •Lightweight tool with the most technologically advanced ergonomic design for reducing work-related risks such as fatigue and injury that effect productivity. •Tension dial offers 33 precise, easy-to-read settings (with ¼" increments) that reduce subjectivity or the need for fine tuning. •Tension lock-in mechanism prevents operator from changing tension setting during critical applications. •Advanced TLC technology provides operational reliability and durability resulting in fewer repairs and an extended lifespan. •Lightweight tool with the most technologically advanced ergonomic design for reducing work-related risks such as fatigue and injury that effect productivity. •Tension dial offers 33 precise, easy-to-read settings (with ¼" increments) that reduce subjectivity or the need for fine tuning. •Tension lock-in mechanism prevents operator from changing tension setting during critical applications. 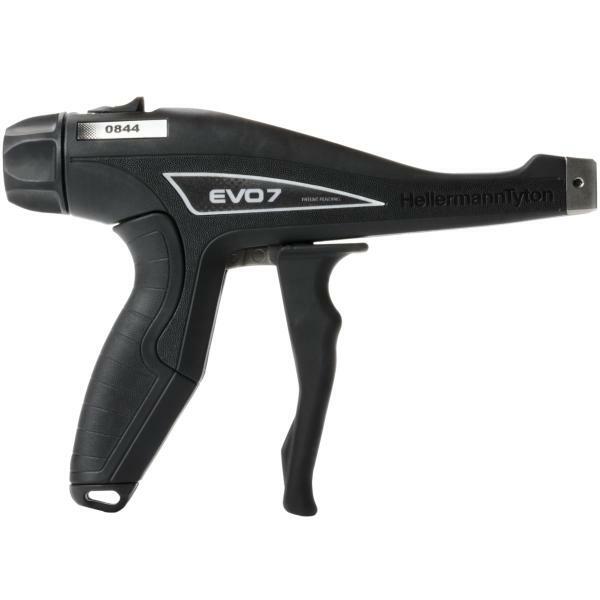 HellermannTyton's EVO 7 mechanical hand tool is ergonomically designed to reduce the risks of repetitive stress injuries to operators while simultaneously increasing productivity. The EVO 7 Tension/Lock/Cut Technology delivers performance, safety and comfort for operators. Available in a standard grip span (EVO 7) or short grip span (EVO 7SP) for smaller hands. Additional accessories are available.